Update #2: Brummble the papertoy tribute to ThreeA vinyl: Heavy Bramble is online and ready for downloading: here. It’s been a while … haven’t posted anything regular in a… year. That would have been the year 2011: the year I became for the first time a dad. So here a little update (for the one person who still reads this blog). Don’t get me wrong: this has been the best year of my live!! But the things I wanted to do this year, the plans I made… nothing of that happened. My daughter happened! and everything else followed HER plans. I wanted to be a part of her live and not only look after her in the weekends. My girlfriend and I both decided to have a 4 days work week so my daughter only has to goes to the daycare center for 3 days. The employer I was working for at that time didn’t want me to work 4 days. I tried to use a dutch-law: they said they would take me to court, etc, etc. I don’t want to make this post about my former employer (if you want to know more about this story, just ask), so I decide that it would be best for the both of us to find another job (1.5 month before my daughter was born…. I know: I’m still bitter about that). But here is the good news (remember: the best year of my live) I found a great new job at noprotocol.nl!!! I could work there for 4 days, they are very flexible and an awesome group of talented people. AND I didn’t miss anything daughter-related stuff, which I can recommend every dad to do: have a day alone with you kid. So the first 6 month of the year 2011 is mostly about being a dad (boring stuff for people who don’t have kids, nothing to explain to the people who have them). Professionally (during the day I’m a Flash Designer/Developer) I learned about Robotlegs, AS3-navigator, LoaderMax, etc. Had some interesting talks with the people of “the bigger boat” (group of freelancers). AND I can do the job in 4 days (sometimes with some creative time-management from my employer and myself) which I knew would be possible, but conformation is alway nice. In the next 6 months of 2011 I started to think about what I wanted. What makes me happy, what is making me happy right now and what will make me happy in the future. I miss the feeling I had when I started to work as a junior designer: wanting to learn EVERYTHING to become a senior. But now I am a senior… what’s next? Do I want to be a programmer for the rest of my live? Questions that are not answered yet. I’m also a papertoy designer (something I do at night). This year was not a good year for papertoys: I needed my sleep! I have done 1 exhibition in Amsterdam and I did an exhibit at Sneakerness Amsterdam (also the first time that I sold papertoys). Both exhibition was done the rest of the dutch papertoy designers (3eyedbear, Marshall Alexander, Dolly Oblong) and one german papertoy designer (Nick Knite). All and all not very productive year. This is my job, this is how I make a living… and Flash is Dead! (again). I’m not worried so I will keep learning even more about that subject. But I need more! I have made a small CMS in 4 weeks in PHP (what an ugly language is that!) but that didn’t excited me much. So I want to learn haXe! I’m quite excited about this language so I will be writing about that soon. finalize (and improve) my project setup. I really have no plans for papertoys: I used to do this to relax, but last year I relaxed by sleeping. There is still two books I wanted to write…. but I can’t promise that it will be finished this year. You can always ask me for a workshop or lecture about papertoys: just let me know! So what can the fans download? I have created a toy based upon 3A vinyl toy: Brummble. That will be released very soon. And more perhaps? Not really a plan for that but sometimes I get a tickle and that needs to be scratched… and the product of that scratching (now this metaphor is getting dirty) will be downloadable. Can you ask me for exhibitions? Yes, please do. I like the idea that my work is art and not only a (paper)-toy. That is also the reason that I have titled this paragraph “Urban”: urban-art, urban-toy, urban-paper that’s what I will be making. Can you ask me for a papertoy book? Yes, please do. I have worked on two books with much pleasure and would be honored to asked for another. Can you ask me for a custom? Yes you can… but time is very precious right now. So your project must be VERY interesting. I have promised to finish a custom Zealot Guard from Abz, and that is what I will do. Why do this custom? This is a VERY exciting project by a (perhaps the only) female papertoy designer. There are some plans to visit Germany for some workshops, but other than that I have no idea. Now I have some energy back in the evening I will be writing again on this blog, but not as often as I did before 2011. I used to write every week. That will change to once a month: a ‘big’ post. The ‘big’ post will be a tutorial or something else that needs more explaining. That will mean that there will be at least 12 more posts. Between these ‘big’ posts there will be some papertoy related images (minimal writing). I will be writing about haXe, so that will be exciting (for programmers). I think I can be of some help making haXe more accessible for the ‘normal’ programmer. When my daughter was born I quit the gym (it was too expensive). I wanted to find something cheaper… It turned out to be very cheap: I didn’t join a gym but I also didn’t do something else. This year I will be joining a gym…. and to be very specific: I want to try Kickboxing! I’m looking forward to 2012! Straat Papier Holland Klik – Workshop promo from Matthijs Kamstra on Vimeo. 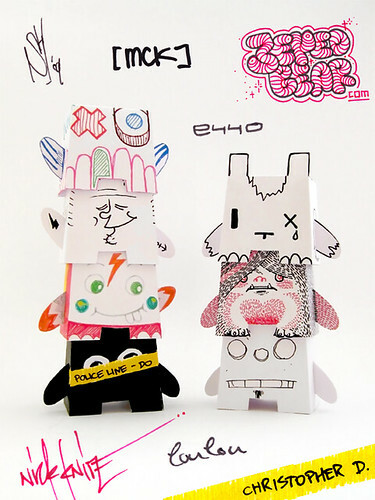 Maarten Janssens (3EyedBear) and me are going to give a papertoy workshop, totally FREE!! A festival where design and crafts go hand in hand. Saturday 26th, 2010 from 1pm – 6pm the square in front of The American Book Center (Spui 12, Amsterdam, The Netherlands) will be an outdoor atelier, with artists creating work on-site for the public to enjoy. Maarten Janssens (3EyedBear.com) and Matthijs Kamstra aka [mck] (MatthijsKamstra.nl) will be given a FREE papertoy workshop at ABC treehouse (Voetboogstraat 11, Amsterdam, The Netherlands). Want to read more about the process visit this blog post or this one. Paperkraft fans will recognise the logo: this is a paper sneaker made for Ron Rementilla from Paperkraft.blogspot.com. He has written about my PUMA First round papertoy and suggested that people who wanted a template should leave a comment…. And Ron mentioned that he wanted one too…. I’m sure that he didn’t mean this, but I needed to create a skin for this model and thought it would be a nice gesture to thank Ron. If you like this, leave a comment. If you build one, show me a picture. If you customize one, … you get the picture …. As I mentioned before: I always wanted to do a papertoy sneaker. When I finished my first PUMA sneakers, and posted it on NPT (Nice Paper Toy), some people mentioned that they liked the model but that there favorite PUMA sneaker is the states/suede/clyde. I didn’t know that the PUMA states/suede/clyde is a b-boy classic. I don’t have a download link for this one, and no design yet…. But that will be fixed very soon. The excellent Ron Rementilla from Paperkraft.blogspot.com has written about my PUMA First round papertoy (thx for that). And suggested that readers who wanted a template, leave a comment…. I call the templates WIP because the instructions are not ready yet. And because I wanted to make the PUMA clyde first, they are not ready yet. Update #1: must read this post, otherwise this code will fail when you place it on your server! I recently started my own company (eMCeeKay.nl) and I need to make a website for it…. Not really a problem besides that I don’t have any time to create a design. So I was thinking about a easy way to update this website without spending extra time on that. Because the main focus of the company is papertoys (urban papertoys), I need design or papertoy related info in my my new website (). And I came with two ways to update it without extra effort: twitter (I tweet about a lot of stuff but primarily about papertoys) and this the content on this blog (category: urban-papercraft). I started with the Twitter part. There are two Twitter AS3 libraries that “speak” to the Twitter API: twitterscript/ and tweetr/. But after reading the source I concluded that it was a little bit to much: I don’t want to tweet from emceekay.nl or do searches, so that was not the way to go. A little google search gave me the solution: http://www.theflashlogs.org/flash/displaying-twitter-feeds-in-flash-with-rss/, simple using the standard rss from Twitter (in my case: Matthijs Kamstra – Twitter – rss). The code on theflashlogs.org is pritty simple, and very easy to use. Because this is part one of what I want to do, and don’t want to search for every link again, I’m posting also the WordPress link here (it’s just because I’m lazy). I’ve already made a Urban paper series – part 1. But as “part 1” already implies; there is also a second gallery, here it is: my Flickr gallery about Urban paper – part 2. I’ve been playing with Flickr galleries, and I made a Urban paper series. So here it is: my Flickr gallery about Urban paper – part 1. I mentioned before that there would be a Urban Paper exhibit in Tokyo organized by Josh McKible (http://www.nanibird.com/), he posted some pictures here. The Urban Paper show opening Sept. 7th at Caf� Pause in Ikebukuro is the latest stop of an international tour of paper toys first published in the book, Urban Paper. Tour stops have included Los Angles and Arnhem, the Netherlands and after Tokyo, the show will re-open in Rome. Paper toys have been around for almost as long as paper itself, but what’s new is that paper toys have recently become a medium of choice for young designers. Because paper is cheap, light and recyclable it has become a populist alternative for artists who previously might have released their toys as collectible vinyl figures. Many of the Urban Paper designers make their toys freely available for download on the Web and anyone with access to a printer can easily make and enjoy their very own paper toy. Urban Paper is the first book that collects designs from 26 of these international artists, printed on heavy stock, along with an included DVD of extra materials, that also gives readers designs and ideas on how to make their own paper toys creations. At the Urban Paper show at Cafe Pause, new paper toys, designed exclusively for the Tokyo stop will be on display, along with posters, postcards and other material. Flat packs of the toys will be on sale, as well as some built models. Read more at jeansnow.net the place where the show is held. At the Urban Paper Toys exhibition at Subwalk in Arnhem (The Netherlands) Dolly asked all designers present to do a custom… on the spot. Totem on the left from top to bottom: MCK, Loulou, Nick Knite, Christopher D.
As you can see, I’m totally outside my comfort-zone… I don’t sketch a lot, and I think you can see that. It seems that I’m know in the papertoy world as MCK, it should be [mck]… but I can live with that.